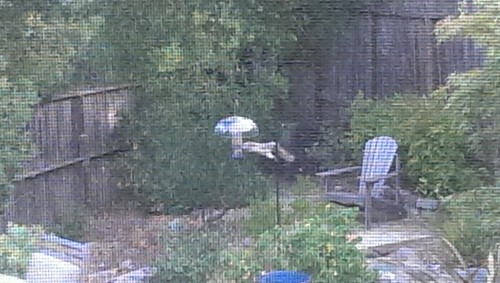 I thought we had sufficient defense in place to thwart the squirrel raids against the backyard bird feeder. But no. See what he’s doing here? Back feet clinging to the post, and a quick grab of the feeder allows him to snag a few seeds. He runs up to the top of the post to snack, then returns to the feeder for more. Others have tried with little success; we would see them try a front paw/back paw grip and reach out to the feeder, only to slowly slide down the post. Let’s hope this fellow doesn’t share his secret with the others.